In arid coastal areas of South America, locals hang rags outside until they're saturated with fog. They wring out this water, all year long, as a means of survival. They call it "harvesting fog." And that, writes LUCI SHAW, is a lot like writing poems. In her poems, Shaw observes and contemplates nature and humanity: "I'm merely a floater in the eye of God." "Behold the fleck of ant... If by observation, we become part of an insect's life, is he aware of us?" Shaw's poems invite us to awaken the spirit of loving and giving: "The tide that outward ebbs, turns then and inward flows, And what I offer you, you'll multiply to me." Shaw's 10th volume of poetry satisfies a thirsty imagination. Shaw turns the details of our lives, the droplets, into the music of possibility. 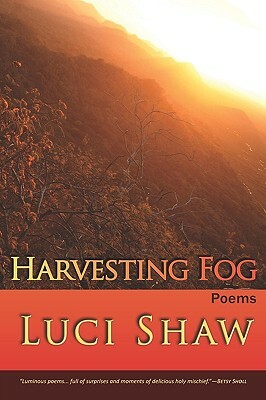 PRAISE for HARVESTING FOG: Luci Shaw sees in the natural world a dynamic incarnation of God's love. Luminous poems, of faith richly woven into the fabric of daily life and change, full of surprises and moments of delicious holy mischief.--Betsy Sholl Intensely personal, her poems also draw deeply on the legacy she has embraced as an heir to Herbert, Hopkins, Dickinson, and others whose shadows fall gently across her lines, giving them texture and adding to their quiet contemporary beauty.--Marilyn McEntyre Envision a long life through imaginative changes of lens. Light becomes a bookish beetle, the Infant Jesus is "a small sack of God," and idea is "a glitter of ash" to be flung over the ocean.--Jeanine Hathaway One might argue with Heidegger that only in poetry can Being achieve adequate articulation, find a "local habitation and a name," become known. For Shaw, whose poems so brilliantly and movingly locate authentic Being in the forms and processes of nature, the lyric impulse often approaches the incarnational.--B.H.Fairchild Sacramental poems offer nourishment for the starving soul with a topping of delightful whimsy, a "bowlful of cool" in the face.--Paul Willis. Luci Shaw is a poet, essayist, and teacher. Writer in residence at Regent College in Vancouver, BC, her writing has been widely anthologized. Her most recent books are Accompanied by Angels, What the Light Was Like, and Breath for the Bones: Art, Imagination and Spirit. Harvesting Fog is her 30th book. For further information, visit www.lucishaw.com.